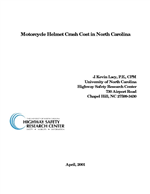 This paper discusses the effects of motorcyclists' helmet wearing on the injuries, and the costs of treating those injuries, incurred in motorcycle crashes in North Carolina. It notes that 86% of the costs of treating motorcycle crash injuries is paid by the public through increased insurance premiums and taxes. It also relates that charges for unhelmeted motorcyclists receiving care for a brain injury are more than twice as high than charges for treating motorcyclists with no brain injury.